A new video highlighting Florida’s burdensome and costly business rent tax was released today as part of a statewide campaign to encourage lawmakers to eliminate-- over six years --this Florida-only tax starting with one percent during the 2016 Legislative Session. “Manufacturers in Florida are growing. When they grow they need more space. Competing with others for land space to build and along with facing months and years of planning and permits forces them to turn to leasing and renting existing space for their expanding operations. When they realize Florida is the only state that charges sales tax on commercial rents and leases, they think twice about expanding here. Reducing the tax will keep more of them in Florida and attract others that provide those well-paying jobs for Florida’s families,” said Nancy Stephens Executive Director, Manufacturers Association of Florida. 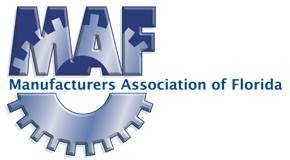 The Manufacturers Association of Florida (MAF) endorses and applauds Governor Scott’s proposed $1 billion tax package, which includes the permanent sales tax exemption on manufacturing machinery and equipment (MME), reducing the tax on commercial leases, and eliminating income tax on manufacturing businesses. The Manufacturers Association of Florida (MAF) participated with the Florida TRADE Consortium, the MAF Center for Advanced Manufacturing Excellence, the CareerSource Florida network, and regional manufacturing associations to help organize more than 50 manufacturing job fairs this year around the state. The results are in and more than 1,300 job seekers have been employed as a result of these job fairs. The Manufacturers Association of Florida is supporting Governor Scott’s proposed Enterprise Florida reforms, including the creation of the Florida Enterprise Fund. Earlier this summer, MAF commissioned a study from Florida TaxWatch to show the effects of the Manufacturing Sales Tax Exemption on Florida's economy. The report highlights the importance of manufacturing to Florida and demonstrates how essential it is to continue to grow. "Given the diverse economic benefits provided by manufacturing, it is in the state’s best interest to continue to foster growth in this sector." Final research conclusions: strengthen incentives, explore additional investments, and expand the sector to allow Florida to become a high-tech hub for manufacturing. The Manufacturers Association of Florida held their 12th Annual Manufacturers Summit & Marketplace in West Palm Beach on November 4-5. During the event, MAF announced the release of an independent study completed by Florida TaxWatch on the importance of the sales tax exemption on manufacturing machinery and equipment to Florida’s economy. Association of Florida announced the winners of the 2015 Manufacturers and Distributors of the Year competition.